To consider some of the difficulties with this approach to care. How can they be integrated so as to serve people better and save money at the same time? Local authority spending on adult social care has reduced by 10% since 2009-10. Key measures of the performance of health and social care sectors are worsening. For example, between November 2014 and November 2016, delays in discharging patients from hospital increased by 37%, due to unavailability of social care and nursing home placements. 48% said it had resulted in financial savings. 20 – 30% in A&E attendance and hospital bed occupancy are achievable among people deemed to be at “high risk” of going into these forms of care. 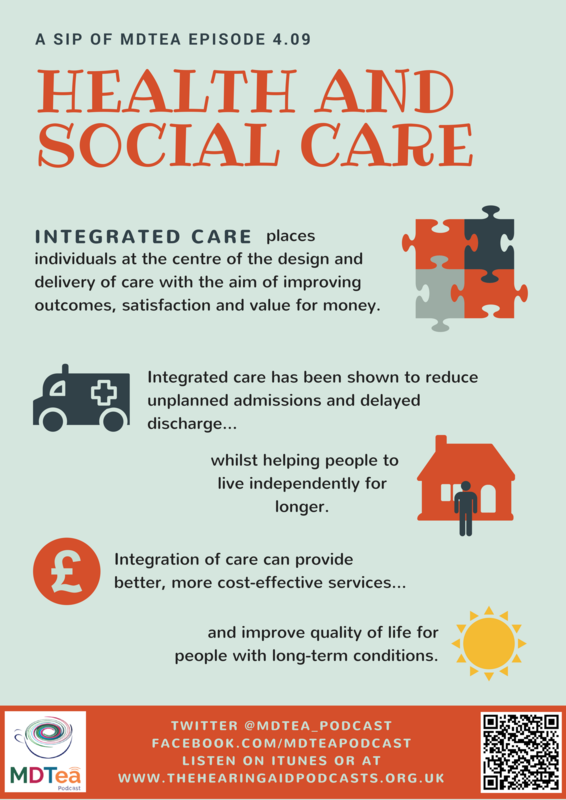 Integration is about placing individuals at the centre of the design and delivery of care with the aim of improving a person’s outcomes, satisfaction and value for money. Armitage, Suter, Oelke and Adair (2009) conducted a literature review and reported that more than 70 terms and phrases related to integration. Armitage, Suter, Oelke, Adair (2009) Health systems integration: state of the evidence. Int J Integr Care. 2009 Apr-Jun; 9: e82. Joining prevention and treatment services. In its fourth annual State of Care report, the Care Quality Commission suggested that at least 530,000 emergency admissions of older people to hospital in 2012–13 could have been prevented through better management of their conditions in the community. There is a tendency to focus on the physical and practical aspects of rehabilitation rather than the social and emotional aspects of care, which are equally as important. By 2018 the number of people with three or more long-term conditions is expected to rise to 2.9 million, an increase of 50%, and if the care system is unreformed the additional cost will be £5 billion. The fragmentation and complexity in how services are commissioned funded and provided. The enactment of the NHS and Community Care Act 1990, lead to 90% of publicly funded social care services – such as care at home and residential and nursing home – being provided by private and voluntary providers. The Health and Social Care Act 2012 means that different parts of the NHS and care system – primary care, social care, acute hospitals, mental health and community health services – are commissioned and funded separately and subject to different governance, accountability and regulatory regimes. The longstanding distinction between NHS care that is mostly free at the point of use and funded through general taxation and publicly funded social care which is subject to a financial assessment – a ‘means test’. Spending cuts and a need to deliver further efficiency savings. The King’s Fund’s influential report, Where next for the NHS reforms? 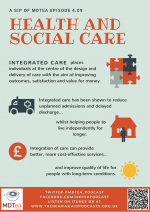 The case for integrated care argues that resources have to be used much more efficiently to meet the needs of an ageing population. Where next for the NHS reforms? The cultural and physical divide between health and social care can often get in the way and NHS and social care professionals regularly fail to understand each other’s unique role, responsibilities and perspectives. Appropriate to their needs – they are less concerned with how these are organised. Improved communication and coordination between the agencies. The Government’s principal policy to achieve integration is the Better Care Fund, £3.8b (not new money) described as ‘a single pooled budget for health and social care services to work more closely together’ so that older and disabled people are offered better, more integrated care and support. The Better Care Fund has been successful in incentivising local areas to work together; more than 90% of local areas agreed or strongly agreed that delivery of their plan had improved joint working. There are report of improvements at the national level in reducing permanent admissions of people aged 65 and over to residential and nursing care homes, and in increasing the proportion of older people still at home 91 days after discharge from hospital into reablement or rehabilitation services. So why is integration difficult? Single condition services: services dealing with single conditions, with attendant dangers of polypharmacy, and excluding a holistic approach to service users. Lack of care coordination: people being unaware of whom to approach when they have a problem, and nobody having a generalist’s ‘bird’s eye’ view of the total care and support needs of an individual. Emotional and psychological support: in particular, a lack of attention to the mental health and wellbeing of people with ‘physical’ health problems. Fragmented care: the healthcare system remaining within its own economy, and not being considered in a whole system approach with social care or other services important to people with long term conditions (e.g. transport, employment, benefits, housing). Lack of informational continuity: care records which can’t be accessed between settings, or to which patients themselves don’t have access. Reactive services, not predictive services: failure to identify vulnerable people who might then be given extra help to avoid hospital admission or deterioration/complications of their condition(s). Lack of care planning consultation: services which treat people as passive recipients of care rather than encouraging self-care and recognising the person as the expert on how his/her condition affects their life. England has legally distinct health and social care systems. The NHS is free at the point of use, while local authorities typically only pay for individual packages of care for adults assessed as having high needs and limited means. Both systems are made up of a complex range of organisations, professionals and services. 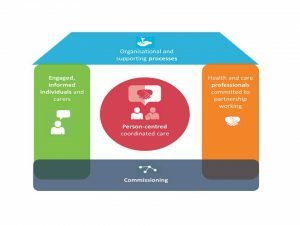 In 2013, the Department of Health launched the five-year Integrated Care and Support Pioneers Programme to support its commitment for “urgent and sustained action” to make joined-up and coordinated health and care the norm by 2018. 25 integrated care pioneer sites (the pioneers) are developing and testing new and different ways of joining up health and social care services across England, utilising the expertise of the voluntary and community sector, with the aim of improving care, quality and effectiveness of services being provided. In 2014, NHS England published its Five Year Forward View, setting out how it aims to achieve a financially sustainable health and care system by 2020 including through integration. Unfortunately the integration of health and social care services has been piecemeal and individually programme based, with good examples tending to be the exception rather than the rule. There is wide variation, inconsistencies in policy and project implementation, and often no significant learning mechanisms in place to aid the transference of best practice (RCN, 2011). (Sources: NHS Future Forum, 2012; Goodwin et al, 2012; Rand Europe and Ernst and Young, 2012; National Leadership and Innovation Agency for Healthcare, 2011; Cameron et al, 2012; Suter et al 2009). Jill is 80 and lives alone. She has chronic obstructive pulmonary disease, arthritis and high blood pressure. Jill’s family live nearby, they are working and help her when they can. Jill gets out once a week to a lunch club but struggles with walking or standing. She is scared of falling but wants to remain in her own home. Better coordination of care with a single point of contact (keyworker) for her and her family. More advice and support for her family who are providing care and support. Fewer avoidable hospital admissions, A&E attendances and care home admissions. Breaking down barriers between services, making life easier for patients/service users. Commissioning – which is not simply procurement but a system improvement process, the outcomes of each cycle informing the next one, with respects to the services to be commissioned. Engaged, informed individuals and carers – enabling individuals to self-manage and know how to access the services they need when and where they need them. Organisational and clinical processes – structured around the needs of patients and carers using the best evidence available, co-designed with service users where possible. Health and care professionals working in partnership – listening, supporting, and collaborating for continuity of care. Informational continuity: by which people and their families/carers have access to information about their conditions and how to access services; health and social care professionals will have the right information and records needed to provide the right care at the right time. Management continuity: a coherent approach to the management of person’s condition(s) and care; which spans different services, achieved through people and providers collaborating in drawing up collaborative care plans. Relational continuity: having a consistent relationship between a person, family, and carers and one or more providers over time (and providers having consistent relationships with each other), so that people are able to turn to known individuals to coordinate their care. Personal level: gives professionals on the front line a framework for what they need to do along with the people for whom they provide care and other providers, and ask local commissioners to secure for them particular services. What: What are the principles and philosophy behind the care which commissioners wish to provide e.g. National Voices ‘I’ statements and what is the model to use as a framework for providing this care for the overall population? Where, When, and Whom: Decide the local model of care i.e. where and when will all the components of the house be delivered for each group of people, and by whom. How: Write the specification of how to achieve this including the financial model that will support what needs to be done (tariffs, contracts, incentives etc that match the model of care). 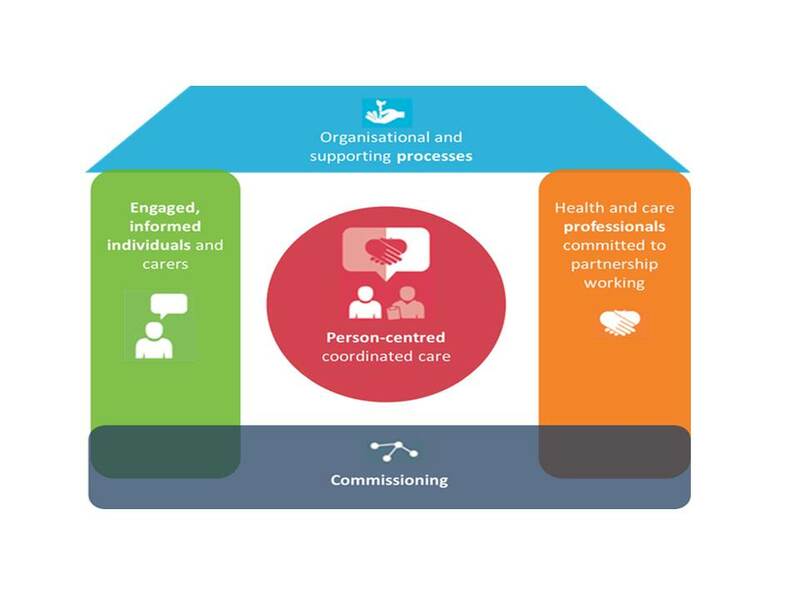 National level: what can national organisations such as NHS England and its partners do to enable construction of the House of Care at the community and personal levels). Offering tailored personal support to develop the confidence and competence needed for effective self-management. Engaged, informed patients and health care professionals committed to partnership working. Develop the skills to support self-management. Partnership working also extends to colleagues, as care for people with long-term conditions will increasingly be provided by multidisciplinary teams, both within general practice but also linking with wider community, social care and specialist staff. Record systems that can be used to document and share care plans, and for monitoring outcomes.